When you begin a game with a brand new party, they begin with no weapons or armor equipped. Immediately [W]ear your cloth armor and get your Daggers [R]eady before doing anything. Quickly look for a town and enter it. Inside the town, the gold you initially start off with will buy better weapons and armor. Remember to buy enough food. When a monster group is vanquished on land, a treasure chest will be left behind. Chests contain 50 Gold Coins on average, ranging from 1G to 99G. In early and 16-bit ports (but not the NES port), they occasionally contain a piece of equipment that can be either used or sold for more gold. Many of the chests are trapped. Either an "Appar Unem"/"Open" spell (Cleric spell B) must be cast to disarm the trap, or a character must attempt to disarm the chest. The Thief has a superior disarm bonus, whereas the Illusionist, the Alchemist and the Barbarian have an ordinary bonus. The remaining seven classes are unfit to dodge traps. Cold (NES only; similar to poison, but it can be transmitted to other pary members). A party can now only see that part of their surroundings as is not obstructed from view. Anything out of direct sight is shown blank. Trees, mountains, walls, and other such barriers will block their vision. Remember to check out each part of an area carefully: many things are hidden just out of sight. 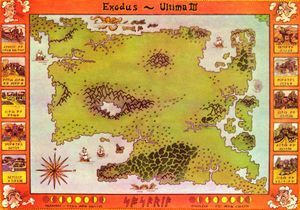 Ultima 3 was the first role-playing video game where the players controls a party of characters, instead of a single hero. As you travel in a party, so do the monsters. When combat is joined, a special combat screen appears. On this new screen, each member of the adventure party is shown separately, as is each monster. 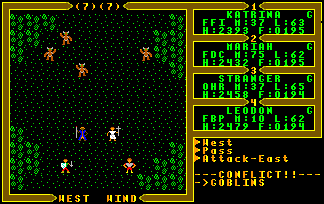 The player may control his characters individually during combat, moving, fighting, or casting spells. Each time a monster dies, the character who struck the fatal blow receives experience points for the deed. When a player accumulates enough experience points, he or she will automatically rise in levels (note: in the NES version, you must see the King in order to rise in level as well as increase your health points). Beware: the monsters are permitted to attack on the diagonals, while a character can only attack horizontally or vertically. Watch out for monster formations where two or three of them can attack a character at once in a crossfire. Once a combat is joined, only one survivor emerges. Explore carefully and slowly. Map everything. Secret doors abound throughout the different dungeons. Magical winds howl down the corridors, blowing out all light. There also exist many traps and pitfalls for the unwary. If the party puts the Thief in front of the Party, he will have an excellent chance of spotting traps before the party trips them; Illusionist, Alchemist and Barbarian also have some dodging ability. If you walk slowly, glimpses of faint mystic writings may be noticed periodically. Many strange and wonderful places are hidden within different dungeons, such as fountains. Some fountains are beneficial, while others are poisonous: always drink carefully at a fountain. This page was last edited on 30 March 2017, at 09:40.